Earlier this week we attended an evening event at Brookside Gardens that included wine tasting and appetizers in the non-butterfly end of the conservatory building….then watching the butterflies respond to the sun sinking to the horizon. When we first entered, the conservatory seemed calmer. The zebra longwings – and other butterflies – were beginning to find a roosting place in the fichus tree. Others were on the walls or ceiling of the conservatory. I’m sure there were many that found a place in the foliage where I didn’t notice them. 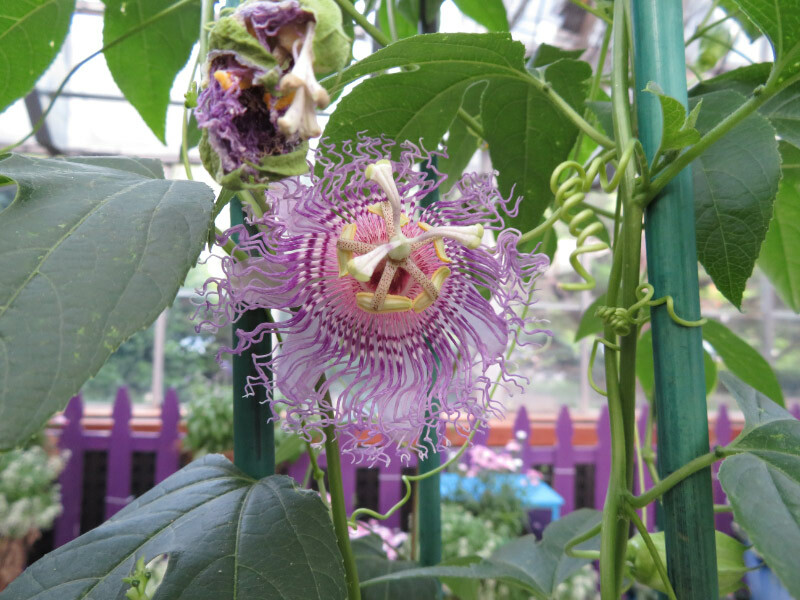 There were two flowers on the passionflower vine that is the food plant for a couple of the longwing butterflies; there were no butterflies around it. Just before sunset, the owl butterflies became more active – many dances through the air. I was waiting for the male cecropia moth that has emerged from its cocoon last Sunday to fly from where it had been hiding in the fichus tree all day. But it stayed where it was. These larger moths do not eat as adults so maybe there was no pheromone in the air of a female cecropia moth…and he didn’t feel the need to move! I contented myself with a zoomed image of it through the foliage.